The 1990–91 NHL season was the 74th regular season of the National Hockey League. Twenty-one teams each played 80 games. The Stanley Cup winners were the Pittsburgh Penguins, who won the best of seven series 4–2 against the Minnesota North Stars. The North Stars defeated the Edmonton Oilers to become the first Norris Division team to appear in the Stanley Cup Finals since all the teams were moved around in 1981. 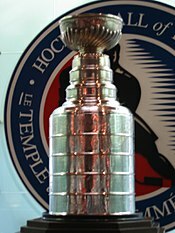 The championship was the first in Penguins history. A record high 92 playoff games were held, and for the first time since the 1973 playoffs, no team was beat in four games in a playoff series. This was the last NHL season to end in the month of May. March 4, 1991: Ron Francis, Grant Jennings and Ulf Samuelsson traded from Hartford to Pittsburgh for John Cullen, Jeff Parker and Zarley Zalapski. March 5, 1991: Allan Bester traded from Toronto to Detroit for Detroit's 6th round pick in 1991 Entry Draft. March 5, 1991: Geoff Courtnall, Robert Dirk, Sergio Momesso, Cliff Ronning and future considerations traded from St. Louis to Vancouver for Dan Quinn and Garth Butcher. March 5, 1991: Mark Hunter traded from Calgary to Hartford for Carey Wilson. March 5, 1991: Mark Pederson traded from Montreal to Philadelphia for Philadelphia's 2nd round pick in 1991 Entry Draft and future considerations. March 5, 1991: Keith Osborne traded from St. Louis to Toronto for Darren Veitch and future considerations. March 5, 1991: Ken Priestlay traded from Buffalo to Pittsburgh for Tony Tanti. March 5, 1991: Dana Murzyn traded from Calgary to Vancouver for Ron Stern, Kevan Guy and future considerations. March 5, 1991: Kim Issel traded from Edmonton to Pittsburgh for Brad Aitken. March 5, 1991: Steve Weeks traded from Vancouver to Buffalo for future considerations. March 5, 1991: Marc Bureau traded from Calgary to Minnesota for Minnesota's 3rd round choice in 1991 Entry Draft. March 5, 1991: Joey Kocur and Per Djoos traded from Detroit to NY Rangers for Kevin Miller, Jim Cummins and Dennis Vial. March 5, 1991: Bobby Reynolds traded from Toronto to Washington for Robert Mendel. March 5, 1991: Mike McNeill and Ryan McGill traded from Chicago to Quebec for Paul Gillis and Daniel Vincelette. March 5, 1991: Ilkka Sinisalo traded from Minnesota to Los Angeles for Los Angeles' 8th round choice in 1991 Entry Draft. This page was last changed on 11 November 2016, at 17:49.